How much data can I store in my free account? What are the different types of IDrive plans? How do I upgrade from a free account to a paid account / higher plan? Do I just pay the difference for this month if I upgrade my plan? I have an older version of IDrive and I wish to migrate my account to the new version. What should I do? I am currently subscribed to IDrive's Unlimited Mobile Backup plan for $4.99/year. What should I do to be able to backup data from my computers? You can store up to 5 GB of data in the free account and try out all the features of IDrive. For more storage space, you can always upgrade to the IDrive paid plan anytime. IDrive Personal is for individuals and home users with data backup and synchronization needs. IDrive Business are for medium to large businesses. There are no restrictions to the number of computers that can be backed up to a single account. Multiple sub-accounts can be created for associates or business departments and easily managed under a single administrative account. Promotional offer: Sign up today and get 25% off on the first year of subscription or get 50% off on the first year for a 2 year plan. IDrive offers various subscription plans with different storage options. Log-in to your IDrive account, and click the Upgrade option. Select the storage space and the subscription plan of your choice, under Plan Options. Provide and verify the credit card details. 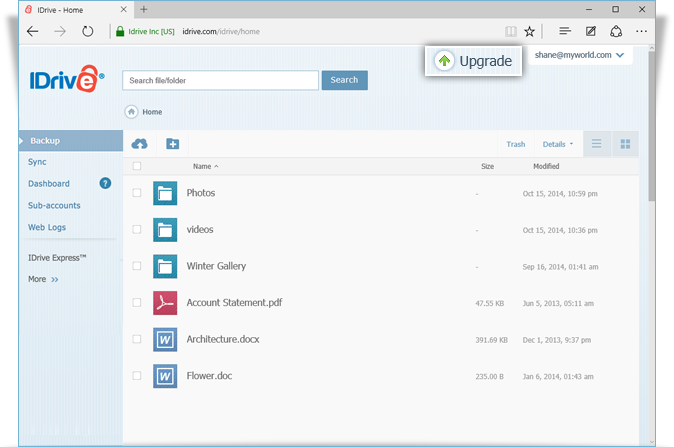 Click the Save Changes button, to upgrade your IDrive account. Yes, if you decide to upgrade your account in the middle of your subscription period, you need to pay the difference amount between the plans on a pro-rated basis. However, if you are changing your billing cycle from monthly to yearly, you will be charged the full amount for the yearly plan of your choice. IDrive accounts created prior to 11/23/2011 used earlier technology, which makes it difficult for automatic migration of data from old to new. All earlier accounts continue to be supported. However, if you wish to upgrade your account to the newer version of IDrive, then you will need to cancel the old account, signup for a new account and backup your data again. In that case, a portion of your credit may be applied towards your new account (decided on a case-by-case basis). With the Unlimited Mobile Backup plan for $4.99/year in IDrive, you get unlimited storage space only to backup data from up to 5 mobile devices. You can upgrade your subscription to either IDrive Personal or IDrive Business, and backup all of your PCs, Macs and mobile devices into a single account.